Slide correct size of plumber’s wrench onto nut. Turn wrench counterclockwise to loosen, clockwise to tighten. Works on 1 3/4″, 1″ and 2 1/2″ drainage pipe nuts. Turn handle to open cutter jaw beyond diameter of tubing. Line up cutting wheel with cutting line on tubing and tighten handle. Rotate cutter around tubing, tightening handle every few turns until wheel cuts through tubing. Use reamer on cutter handle to deburr and clean out edge. 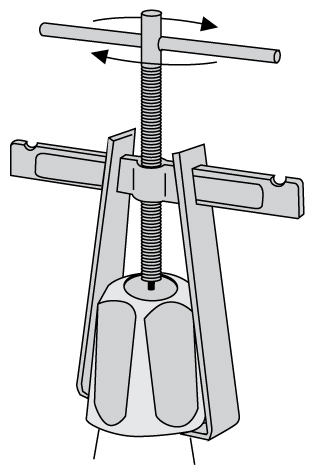 Open the wrench’s spring-loaded jaw and place over nut. Allow jaw to ensnare nut. Turn handle to loosen or tighten nut. Wrench is designed to operate at any angle. Turn off water supply. Remove handle assembly and flange to uncover valve stem and packing nut. 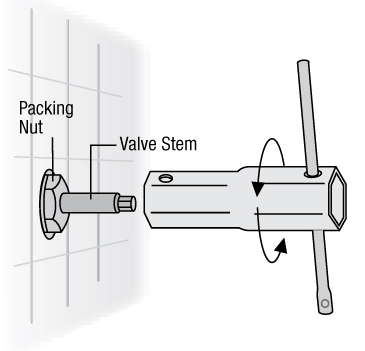 Place correct size end of valve socket onto packing nut. 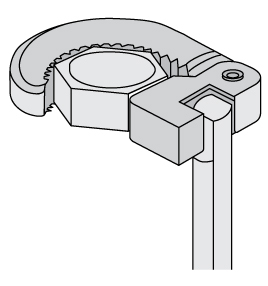 Insert handle through other end of wrench and turn counterclockwise to loosen packing nut. Deburr inside of tube. Select proper hole in sizing bar that is closest to but smaller than tube’s diameter. Insert tubing and tighten nearest wing nut. Make sure tubing protrudes 1/8″ above top of sizing bar, then tighten second wing nut. Turn handle to drive flaring point into tube end until desired flare radius is achieved. 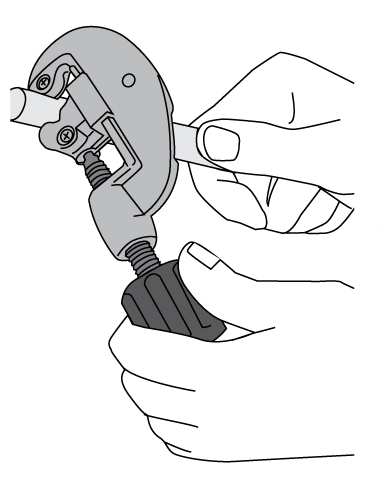 For Removing Frozen Faucet Handles: Place faucet puller over faucet handle with legs under handle edges. 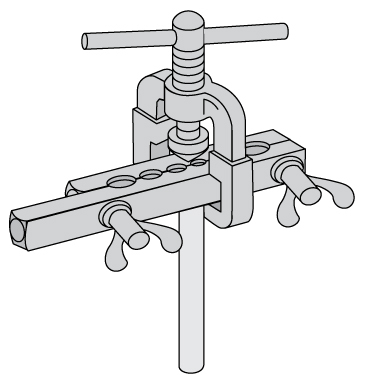 Insert threaded stem of puller into faucet screw hole and slowly turn puller handle clockwise. 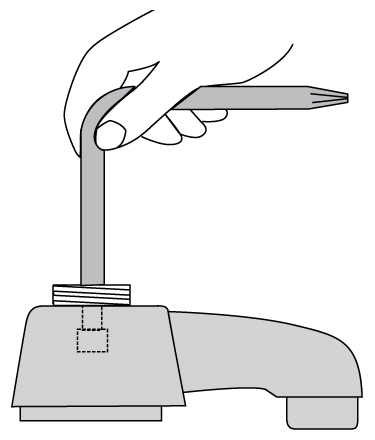 Continue threading stem slowly into faucet screw hole until faucet handle can be removed. For removing 3/8″ and 1/2″ compression nuts and sleeves: Place coupling into end of copper tubing. 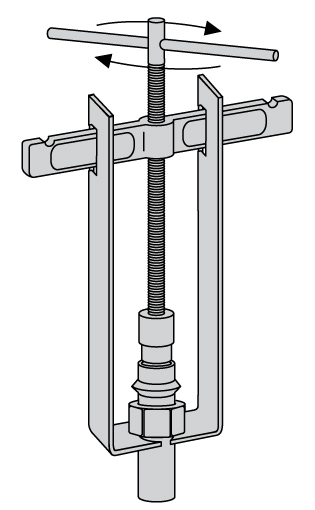 Insert threaded stem of puller into coupling and position legs of puller under compression nut and sleeve. Slowly turn puller handle clockwise. Continue turning handle until compression nuts and sleeve separate from tubing. Slip flared end of spring over tubing and slide to area to be bent. Bend spring and tube slightly beyond the desired angle, then back to the desired angle. Remove spring by turning flared end clockwise while pushing spring off tube. Turn off water supply. Remove faucet handle and stem. Attach correct size cutter (compare with washer for size) onto threaded end of tool shaft. When it is tight, thread lock nut down to lock it. Turn tool clockwise in stem opening a few turns to smooth seat. Make sure seat surface is free of nicks and dents. Clean with brush if necessary. Replace washer and re-assemble faucet. Turn off water supply. Remove faucet handle and valve stem. Insert proper end of the faucet seat wrench into the seat hole. Turn the wrench counterclockwise and remove the seat. 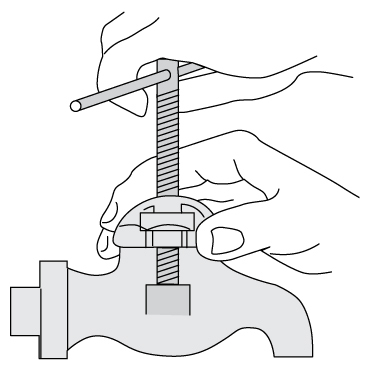 Insert new seat into the faucet and turn wrench clockwise to tighten. Clean surface to be repaired. Place rubber sealing pad over leak and place one clamp over pad. Do the same to opposite side of pipe. Insert bolts through holes in clamp and screw on nuts. Tighten bolts evenly until firm resistance is met and leak stops. Clean male and female parts to be soldered with abrasive cloth. Be sure not to handle cleaned area. Apply soldering paste to both parts with soldering brush. Slip male and female parts together and apply heat to the female part. Place end of solder against heated joint. The solder will melt, flowing up into the joint. Do not heat solder itself. Helps provide a leak-proof seal at pipe joints and provides for easier disassembly at later date. Wrap one layer of tape tightly around male pipe threads in clockwise direction. Do not use on plastic threads. 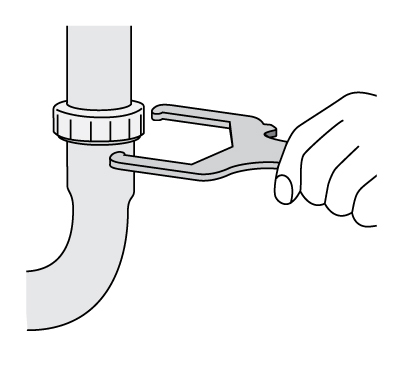 Pipe dope should be applied to plumbing connections to assure a proper leak-proof seal and to make connections easier to disassemble if necessary. Do not use on plastic. 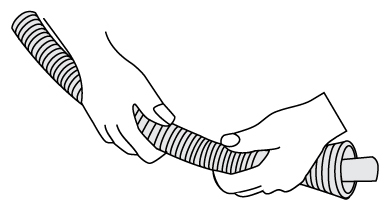 Use finger to apply thick layer of pipe dope to pipe threads. When project is complete, wipe off excess pipe dope.